Happy (almost) February! We have one major snow storm under our belts, and I’m pretty much ready for spring, I’m not sure about you guys. At least while we wait there are books to be read, including these five February releases that I can’t wait to check out! Girl Runner by Carrie Snyder: Girl Runner is the story of Aganetha Smart, a former Olympic athlete who was famous in the 1920s, but now, at age 104, lives in a nursing home, alone and forgotten by history. For Aganetha, a competitive and ambitious woman, her life remains present and unfinished in her mind. When her quiet life is disturbed by the unexpected arrival of two young strangers, Aganetha begins to reflect on her childhood in rural Ontario and her struggles to make an independent life for herself in the city. (Goodreads, February 3). Letter to a Future Lover: Marginalia, Errata, Secrets, Inscriptions, and Other Ephemera Found in Libraries by Ander Monson: An exuberant, expansive cataloging of the intimate physical relationship between a reader and a book. What are you looking forward to reading this February? I’ve been dying to read the third installment in Maureen Johnson’s Shadow series forever, and I can’t wait to finally find out what happens. I recently read My Sunshine Away (out Feb 10) and loved it. I’ve also got Welcome to Braggsville, Golden State, The Half Brother, and A Touch of Stardust on my list for Feb. I’ve seen Ice Cream Star around lately and might read it if the reviews are good…haven’t seen many blogger reviews of it yet. I also have Girl Runner on my radar! 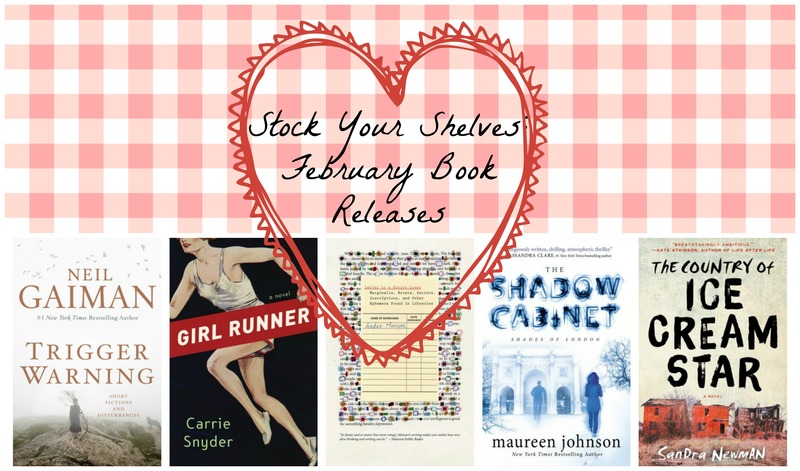 February is looking like a great month for books! I just looked up My Sunshine Away and will definitely have to check that out! I enjoyed Girl Runner, and I’m so excited for Letter to a Future Lover and The Country of Ice Cream Star! I think I’m most excited for Letter to a Future Lover and The Shadow Cabinet! I had not heard of Letter to a Future Lover and I think i need to own it. I used to dream that my partner and I would scrawl stuff for each other in the margins of books and newspapers. It’s never happened. But wouldn’t it be great if it did? Aww, that really would be! I’m not usually one for made up dialect either, but the premise itself reminds me of Station Eleven, which I absolutely loved! I’m dying to read My Sunshine Away! The dialect of Ice Cream Star has me a little nervous, too!